Carbon Poker is closing new sign ups and are in trouble, please choose another room. Carbon Poker App downloads now point to the 888 Poker app. Carbon Poker Mobile is now available on all mobile platforms including: iPad, iPhone, iPod Touch and Android devices both mobile and tablets. This is the first poker app which allows USA poker players to play mobile poker games on their device. 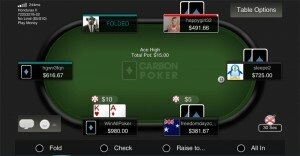 The Carbon Poker App is browser based so it’s compatible with mobile devices with web browser preferably Google Chrome. New players can sign-up for a free account and players than already have a Carbon poker account can simply log-in to play. Visit CarbonPoker Mobile using your mobile device’s web browser. Players can sign-up or login directly from the link provided. Carbon Poker Mobile app offers free and real money No Limit, Limit and Pot-Limit Holdem cash games at this stage with plans to add tournaments and Omaha games in the near future. Overall the Carbon Poker App runs fairly smoothly on the Android tablet we tested it on, bookmark the link or add a shortcut for easy access. Free Poker & Real Money games. Cash Game: No Limit, Limit and Pot-Limit Holdem. Web browser software which supports most devices. Playable on Google Chrome web browser, no download. Carbon Poker Mobile is out of beta mode and has opened up to real money poker games for players worldwide including US poker players. Cash game players can enjoy all the action as we wait for the tournaments and SNG games to be added to the mobile poker app. Another missing feature from the CarbonPoker App is their version of a fast fold poker game which would also be a great addition to the mobile software if it was developed. Depositing players get a 200% first deposit bonus up to $5,000 on Carbon Poker, plus regular reload bonuses for players every month.